The first large box of D&D minis I remember seeing was the “Monsters” assortment. Those Grenadier boxes were a little bit like boxes of chocolates because you never really knew for certain what would be inside — almost every box seemed to have a miniature broken or missing, and/or a miniature not shown on the insert, and/or a duplicate of some miniature. It never occurred to me back in the day to complain to the company or ask for a replacement; I have no idea if they would have. The “Tomb of Spells” was perhaps the worst offender: I didn’t get the lamia or night hag at all, which were on the insert, though I did get alternative sculpts of the djinn and efreet (not the ones on the older insert though; the ones in the blister). Anyway in the case of the Monsters box, I got the set as shown on the insert except that my Yeti was the later version. (For some reason I always remembered having both versions in my collection, but I can’t think of way to account for having two yeti, so maybe I never had the original.) 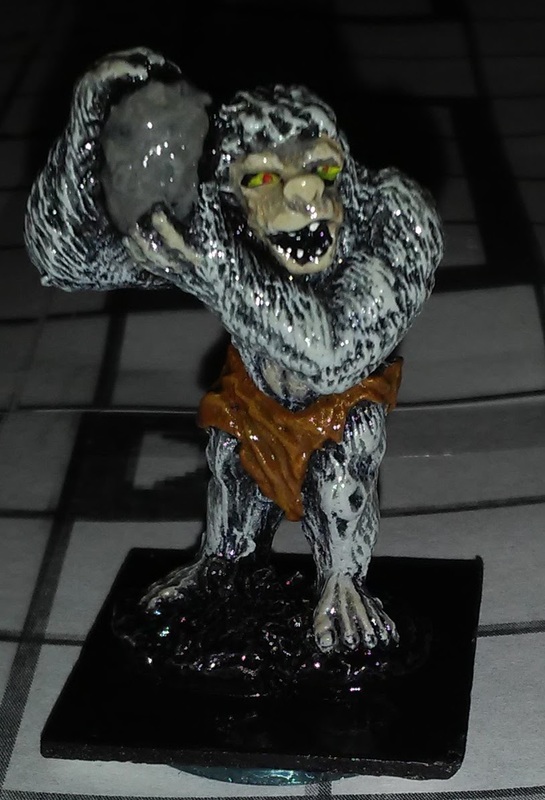 Anyway a recent trade yielded not only the cone-head yeti but a sort of missing link between the two sculpts: the ogre from the Wizzards & Warriors range. 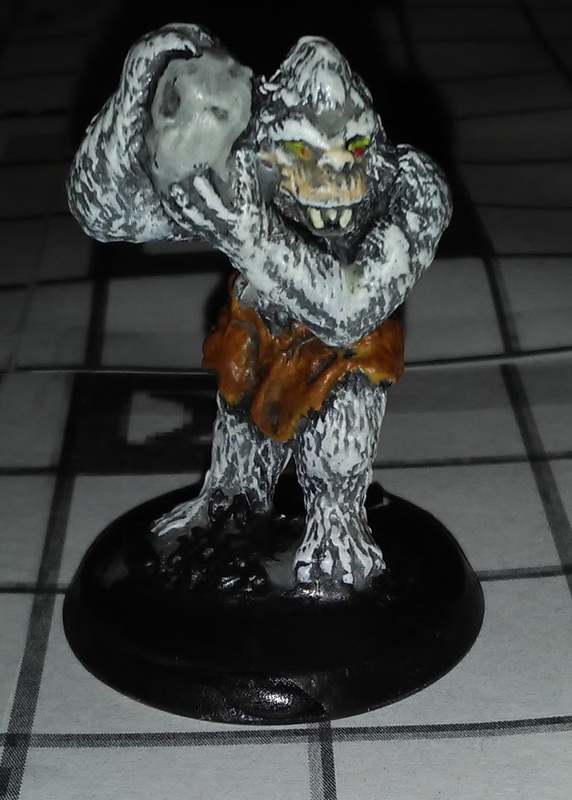 (I also got the earlier, smaller ogre with a similar face but he’s not hairy enough to pass for a yeti so I haven’t painted him yet. 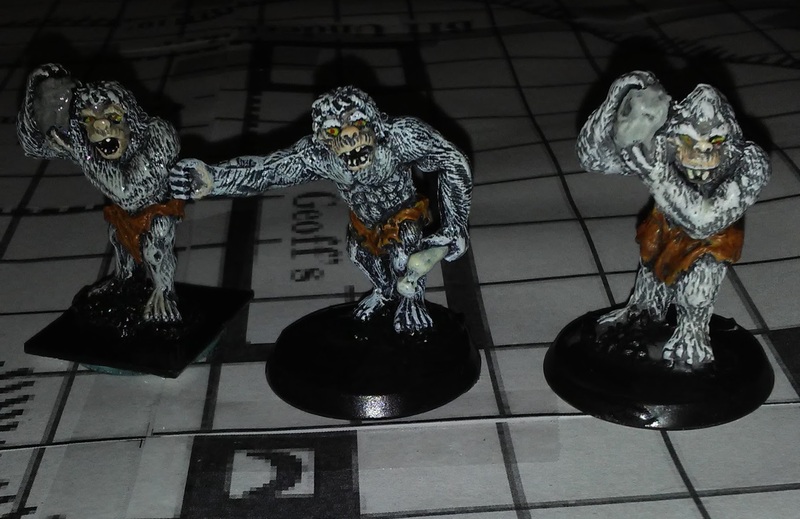 So here are the three yetis side by side. The original design is closest to the Monster Manual version — especially if that is not just a tuft of hair but a misshapen cone-head. 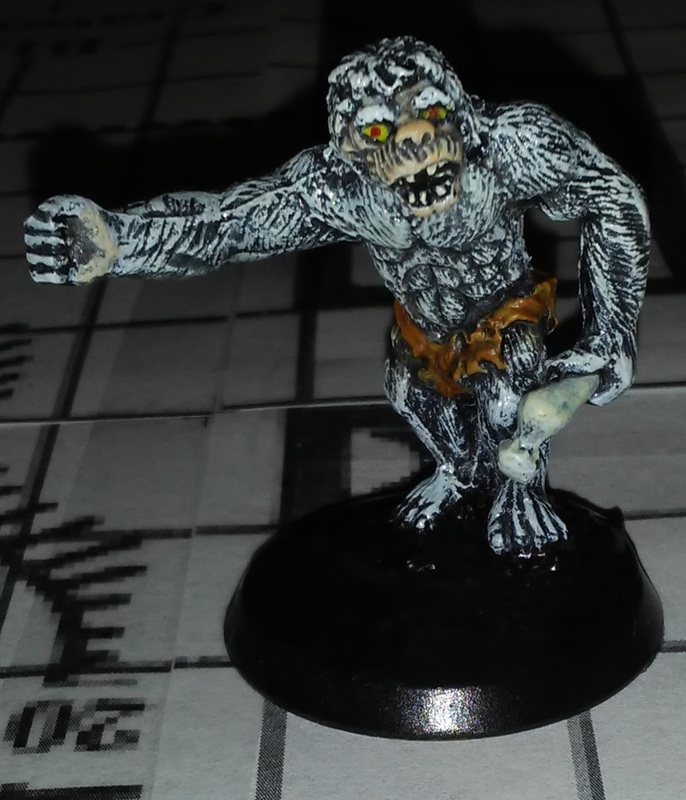 Yeti from the Monster Manual, via Wikipedia. By David Sutherland. His replacement has a more rounded head. Mine has had his nose squashed a bit from falling on his face, and looks more upturned than it would be fresh out of the mold. If you look at the three of them, what’s interesting is that the final yeti design incorporates the older yeti’s pose but many elements are clearly from the ogre. The loincloth is different on all three, but look closely at their backs and feet. I think I only remember the cone head one. 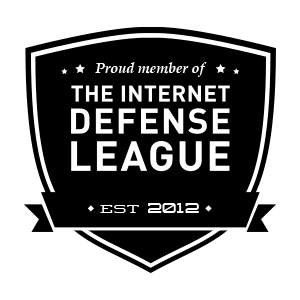 I think that it’s more surprising how many survived. Minis companies weren’t (aren’t) very financially stable, the vulcanized rubber spin molds wear out fairly quickly, and many of the brass production masters are maybe an inch high. Add in that most of this stuff is from well before any kind of automated inventory and it would be a nightmare to take over from somebody else, assuming that anyone would want it. Even big companies like GW change their stuff fairly regularly because when steel molds wear out, creating a new product is only minimally more expensive than recreating an old mold that your customers may already have enough of.